VW Tiguan AllSpace – On the Scheme or Not? This topic contains 50 replies, has 9 voices, and was last updated by BackCountryBob 2 months, 1 week ago. long term viewer of the forum for a while now. Informative and entertaining in equal measure – quite unusual for a forum! My Daughter’s VW Sharan is due for change in May and have been somewhat spoiled by the huge amount of space available. Not the most emotive of driving experiences but functional and given good service these past 3 years. Had a test drive in the standard Tiguan, which was lovely, but the capacity of the boot would not suit our needs in that guise. The AllSpace is much more suitable, although still not a patch on the Sharan, but acceptable none the less. Dealer says he can order a MY19 SEL DSG 4-Motion for £2999 – I say he can’t from the knowledge gleaned within the forum. Previous supplying dealer confirms the AllSpace isn’t currently on the scheme and, when it does, the most likely variant will be the Match Trim level. Unlikely, the SEL will be available due to the CAP, given the DSG and 4-Motion requirement. Motability, this morning, confirm their Pricing Teams have not yet reached agreement on which versions and what AP’s are likely. This is likely soon but pretty non-commital it has to be said. Just waiting and scrutinising the Motability website in earnest, in anticipation of the AllSpace’s arrival on their. Unless anyone has actually genuinely ordered one recently? Moral in the story – treat Dealers like Brexiteers. You really can’t have your cake and eat it lol!! I ordered an Allspace se Nav on Monday evening which doesn’t show on website. I asked specifically. Was told they are only available from stock. It has been built and I should have very shortly. 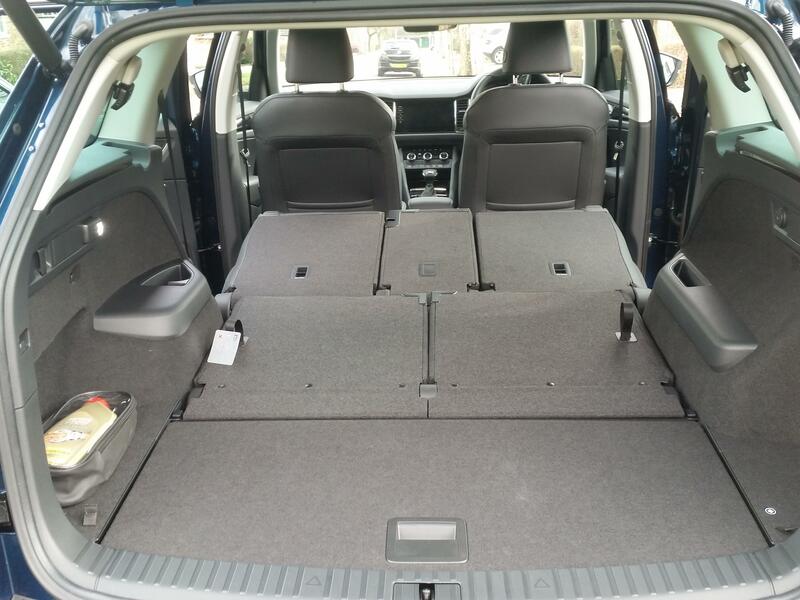 We looked at the Allspace when it first came out as, whilst we would never use 7 seats, the bigger boot would be useful (my wife uses a wheelchair). We were unimpressed with the boot, in that the rearmost seats don’t sit flush with the boot floor when folded and made the boot quite ‘messy’ with uneven levels. If boot space is a premium, it might be worth looking at the Skoda Kodiak. I haven’t looked at one as my wife wouldn’t even entertain it, but I’m sure I’ve read that the boot is flatter with the rearmost seats folded. Also, I have been unimpressed with the lack of grunt with our 190PS 4Motion DSG Standard Tiguan (amongst other things) and the fact that we are only getting 39mpg and the fuel tank is too small, so fill ups are needed too regularly (very irritating in these temperatures)! I should imagine that all of these issues are even worse in the heavier Allspace. According to Honest John 39mpg is on the money for your version. The 150 dsg 4wd is a little better @ 44 and the 150 dsg 2wd 48mpg. I have read on some of the road test both the higher powered Ford Kuga 180, Mazda 180 and VW 190 the extra performance is further up the power band, and in everyday use you are better of with the 150bhp versions, how true this I don’t know. I think you might be correct re the power band Oscarmax. Sometimes you have to absolutely floor the accelerator before the damned thing takes off. My wife had an old shape 140PS Tiguan and that didn’t have these horrendous flat spots. It was much smoother to drive. I’m afraid that I wouldn’t recommend the Tiguan, but if someone is dead set on getting one they should be aware that the 190PS does not in any way feel like a fast car. If people can live without 4WD and have a fairly sedentary driving style, I think that the 150PS 2WD would be a much better bet. Our previous car a 2013 Honda CRV 2.2 diesel our current car Ford Kuga 2.0 diesel on paper the power band are virtually identical, but in reality they are chalk and cheese the Ford Kuga is vastly superior. Thanks for the replies guys. The 2.0 TDi at 150 PS suits my driving style in the Sharan really well and get in the mid 40’s MPG, so anticipate something similar in the AllSpace. I had never contemplated getting an automatic but the DSG coupled with the electronic handbrake makes driving so ridiculously easy I would not return to manual. We will need 4-motion for our planned move to a rural home in the the Scottish Borders. Can anyone please tell me the difference in boot capacity between a 5 seat and 7 seat Kodiaq? I assume the seat mechanism cuts down the space available. There’s a small difference between the 5 seat and the 7 seat, 2065lts to 2005lts, respectively, with all seats down. The reason I ordered the 7 seat over the 5, was because the 5 seat has a 2″ ridge when the rear seats are folded down. Please don’t be put of by the badge, it’s a fantastically built SUV, voted best in its class by just about every motoring magazine. Just test drive one, you won’t be disappointed, I promise you. we’ve been more inclined towards the VW simply because this makes the handover much simpler. We live in Sheffield and got the Sharan from Inchcape Manchester who were simply fantastic procuring the Sharan in a very short space of time three years ago. The service was quite exceptional, making me feel genuinely disloyal to not use them again! Given the recent comments regarding AP’s increasing, availability decreasing and the apparent use of the Scheme as a place to offload stock and outgoing models, I’m inclined to purchase something outright instead. As other note, discounting is rife and CARWOW is our friend enabling stress-free haggling from the comfort of your own armchair! Admittedly, it might not be possible to secure as much car for £240 a month all in, but with AP’s so high that money might be more efficiently spent towards a PCP deposit which enables ownership at the end. Putting £3,000 deposit down on a car you’ll end up owning, that you’ve negotiated an £8,000 discount on and paying ~£110 a month more for (plus car tax and insurance) would seem a better value for money. Particularly, when the choices are not arbitrarily limited by the procurement department of the Motability Scheme. Once you get into thre 18inch plus tyres on the Tiguan a set of decent tyres a year you won’t get much change from £200 a corner, 19’s or 20’s £1000 a set. plus on the scheme you get a much lower excess on the insurance too and I’m in my 50’s with full no claims. Once you add in the servicing and the 3 years breakdown it sounds like a real bargain. I did think like you for a long time but tbh the scheme is a bargain. Plus you get £500 back at the end if you keep it tidy? I went for the 150 Dsg 2wd Tiguan SEL, as I read how the 7 speed box didn’t suit the power band on the higher bhp. Plus this car was a cancelled order and had £1000 extras on it and was still unregistered and ready immediately in the colour I wanted. We had a 184 bhp Dsg touran before and this feels as quick or quicker. Averages high 40s on a run and I love the heated massage seat. Bliss for me! For those who don’t have capital or are unable to get finance, or would struggle to get insurance, the Motability scheme is indeed a no brainer however, if these issues don’t apply, then it’s not that straightforward. A year or more ago I provided a detailed worked example on here of the fact that I bought a brand new £41k BMW 5 Series at the same time as my wife got a £31k VW Tiguan on Motability. First of all I negotiated £10k off the BMW, so it cost £31k. I then monitored the running costs of the BMW over the next 3 years (depreciation, insurance, Road tax, tyres, servicing etc) and guess what? When taking into account sacrificed PIP, the AP paid and cost of options added to the Tiguan, the two cars cost the same to run over the 3 years. And I still own the BMW (outright) over 3 years later. Private car costs aren’t always as scary as people think. My road tax is £30 a year. My insurance (I’m in my 50’s too) less than £300 with £100 excess. Servicing pack purchased with the car gives me 5 years free servicing. Only two tyres needed in first 30k miles (more mileage than most Motability drivers do in 3 years). Breakdown cover included within 3 year manufacturers warranty. Finally, I know which of the two cars I preferred over the last 3 years! For those driving much cheaper cars I suspect that the case for opting out is even more compelling if you have the means to do so. If you don’t have the means then of course Motability remains a fantastic scheme. Hi Glos Guy, Interesting example of ownership. After 3 years what happens? Do you suggest keeping ,in your case the BMW, or do you assume it’s worth approx £23k, get another discounted new car and stump up £8k, and repeat this every 3 years. Im confused, can you elaborate your logic and maths over several year cycle ? This is not criticism Glos, I’m genuinely interested. Wonky – I got the car under a standard manufacturer PCP, which gives you either option. At the time I bought the car there 3 separate discounts that combined cumulatively. One was a BMW UK contribution, one was a dealer discount and the final one was a BMW financial services one. The three totalled £10k which was a 24% discount. At the time, my intention was to run the PCP until the end of 3 years and then decide what to do, but after the first year I realised that the car was a peach, was perfect for my needs and would see me out to retirement (which it has). I also had the benefit of a 5 year servicing pack and my mileage was working out at quite a bit less than the PCP cost had been calculated on, so I bought the car outright. My detailed calculations (which I provided on here last year, so won’t repeat) obviously didn’t include the cost to buy outright (as that wouldn’t be comparing apples with apples) but the depreciation from the discounted new cost to the value at the 3rd year. The final payment to buy outright was obviously in addition but gave me an asset, albeit a depreciating one. Obviously it only works if you have some capital, are willing and able to haggle a really good discount, take advantage of servicing plans etc. All of this applied, plus we live in a low cost insurance area and I have maximum no claims bonus (protected). Of course, all of this begs the question why did my wife get another Motability car? Even though she could fully see the cost comparisons when I took her through it all, she said that she likes the ‘hassle free’ aspect of a Motabilty car, which is what keeps the vast majority of people in the Motabilty scheme. Keep in mind though that only one in three of those people who are eligible to join the Motability scheme choose to do so. I struggle to believe that none of the other two-thirds have cars. Those that do have clearly sourced one through other means and, of course, not all will feel the need to have a brand new car. I actually went to the BMW dealers to look at a specific used 5 series but it had just sold. The very helpful saleswoman said, “I can get you a new one for that price, would you be interested”? Rude not to! Hi Glos, thanks for your patience and explanation. It makes good sense, as you say , for some people. There seems to be more and more people on this site dissatisfied with the choices of vehicles and purchasing opens up more choice. As wonky says i guess it depends where you live etc and your needs for me it’s a bargain and a no brainier. Dealers knowing your a motability customer tend to leave you hanging like you’re the living dead? Most are dreadful and lie through their teeth. There is no way could we get insurance on a 5 series bmw round here or an SEL Tiguan with anything close to £100 excess for £300, let alone £500 or add a 25 year old siblings for free in my post code in west London. Free congestion charge every day for all, as we live just outside the charge zone. We used to go through a pair of front tyres every 12kmiles, or once about once a year, plus multiple punctures, most repairs couldn’t be fixed, so more tyres from our local tyre shop, mutilple cracked screens from daily M25 journey at £100 a times glass excess. I’ve already had a new pair of tyres as we picked up two 8 inch brand new screws on an empty m25? Didn’t notice until the warning sign was on the next morning. The mobile tyre repair service swapped them like for like in about 20 mins on the drive. Our last car inc the added costs of out of hours tyres charges by the RAC of £237 each time (only 17” budget tyres, as the car had no spare wheel and I couldn’t have changed it anyway ) stranded on the m25 hard shoulder, no disabled priority so hours of waiting too. Now I can’t drive often, so two of my siblings of 25 and 27 both with various previous claims drive my wife and I most of the time and as they both work free lance and earn good money, they cover the fuel costs, yes I’m lucky I know. Insurance quotes for just one was over £5k with £600 excess on the Tiguan for a London postcode, on the older one it was about £1800 with a £500 excess. Mine was roughly the same our old car about £240 for the Tiguan with average miles of 12’000 and protected no claims but I don’t know how much longer I’ll be allowed to drive? My wife can’t drive being epileptic and type 1 diabetic but she’s also entitled to a car on the scheme too. I could quite easily buy a new car straight out and I thought about for a long time as the cars on the scheme are a little restricted, but we worked out that for us the scheme would save us thousands in insurance alone one my kids were added. As the insurance was even higher on a top spec Land Rover ot 4×4 jag. plus they are the choice of thieves around here and BMW’s I wouldn’t want to chance never seeing it agaian and then having an even higher premium each year. You did really well only buying 2 new tyres in 30k or maybe I read it wrong, wrong meds have some odd effects on me, including my reading and writing. Could just be driving style? Philjb- As I said, it would only work for some people and if I lived in London and had to suffer insurance costs of that magnitude (not to mention any challenges in obtaining insurance due to medical reasons) then, of course, Motability is a no brainer. I wouldn’t consider opting out of the scheme myself in those situations. I’m certainly not trying to encourage others to opt out, I was replying to a question and merely stating that we would consider it based upon my personal experience of having run a Motability car and a private car for the same 3 years, side by side. To go back on topic, I would like to add some balance to my negative comments about my wife’s Tiguan. We were in the epicentre of Thursday night / Friday mornings snowfall (Sky news were reporting from near here). Whilst I like my BMW 5 series, as with all rear wheel drive cars, it is pathetic in the snow. Think Bambi on the frozen pond. So, when we awoke to 6 inches of snow and it was still snowing heavily, my only chance of getting to work was to commandeer my wife’s Tiguan. I switched the variable drive into ‘Snow’ mode and gingerly drove out of the garage. I have to say that the car didn’t miss a beat. Not an ounce of wheel slip, no tramlining, no skidding on (gentle) breaking. When I got to the main roads I just switched back to standard 4 wheel drive. I got to work and back, including manoeuvring in a very snowy car park, without any issue whatsoever. The only ‘problem’ was that the slushy spray, that covered the car, caused the Adaptive Cruise Control and Front Assist systems to disable as the camera became obscured. The Allspace is on the scheme, but only in Match trim. that’s a lovely way to start a crisp winter morning! And what a pleasant surprise AP wise – ignore what I wrote earlier, that’s a lot of car for £1449. I wonder why the 2WD is £200 more than the 4WD? Incredible value compared to the Kodiaq. I have noticed the Match has a rear view camera, front and rear parking sensors and parking assistance, lane assist, complete with electric tailgate. The model on the scheme that would be of interest to me is the 2.0 diesel 150 BHP automatic (DSG) Match @ £1149. thars why I agreed about if depending on circumstances? I never thought I’d ever have to claim pip or anything else, we live in a a nice part of west London, with our house paid for then two years ago I’m relying on a wheelchair and Zimmer frame in my 50s. The tiguan is a great alround car. When I had my business we had a new car each when we fancied it. Never bought a car via pcp or whatever it is. Straight cash buyers. We don’t need 4wd because we are gritted to death even wirh the mildest frost. The new Tiguan has been faultless and mpg is good too, plus the massage seat on the SEL is just bliss for me. The boot is as big as we need and my girls feel safe driving it as it doesn’t feel massive and the steering is on the light side at low speeds. i dont tink think you were being negative as I too had the same thoughts till I realised what it would cost to is sure my kids on a new car suitable for my needs. Wow! Then in the scheme was a massive bargain. Unless you live in the country? Our Tiguan 2wd has never once lost grip or failed to make it up any hill thrown at it. Plus it’s returned near 50mpg and no doubt has more to come as we put the miles on. If you try reading marshal vow they had a further £350 off the AP. Hi all, been following this thread and am now confused. I too have spotted the AllSpace 2.0 ltr diesel dsg 4 wheel drive for £1449 ap. However on Motability it has 148bhp but on VW it has 190 bhp, can anyone explain? As Glosguy says , the 4wheel is £200 cheaper than 2 wheel, strange. I wouldn’t believe what a dealer tells you. Give motability a ring maybe they can help. The scheme is never easy, to get exactly what you need. Plus the dealers will tell you they are ace. 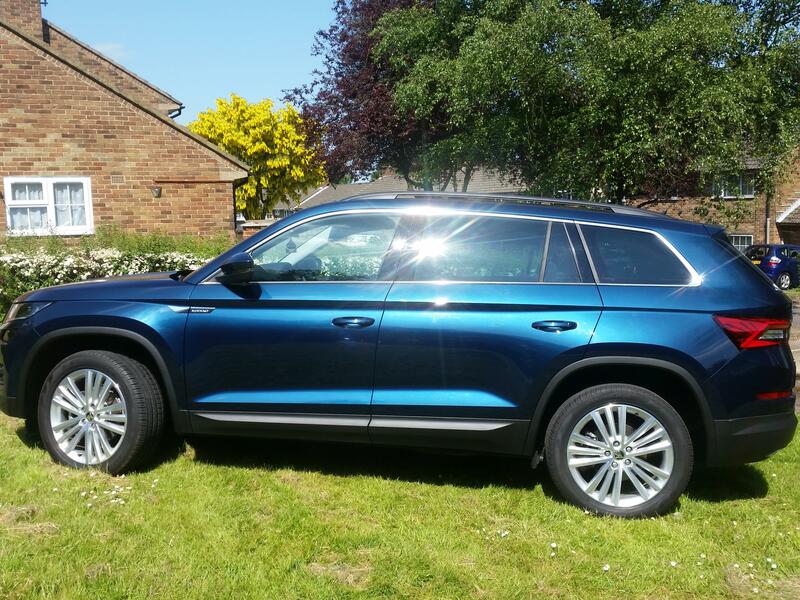 Reply To: VW Tiguan AllSpace – On the Scheme or Not?